G.M. Collin Hydramucine Optimal Serum (1 oz) - Shop at Skin1! Best For Dry / All Skin Types. G.M. Collin Hydramucine Optimal Serum instantly relieves dehydrated skin with a surge of moisture that penetrates deep into the skin. A combination of high and low hyaluronic acid provides moisture while an advanced hydrating formula prevents water loss, improves water circulation within the skin, stimulates ceramide production, and boosts skin's ability to regulate moisture levels. Perfect for dry environments and colder months, G.M. Collin Hydramucine Optimal Serum plumps skin to minimize fine lines and restores a supple, hydrated complexion. Plumps skin to diminish surface lines and wrinkles. 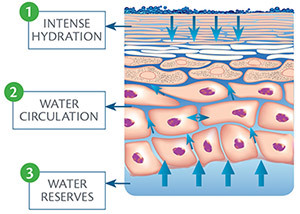 Fortifies skin's moisture barrier to prevent water loss. Improves skin's ability to maintain optimal moisture levels. Leaves skin soothed, soft, and supple. Apply to face and neck morning and/or evening after cleansing and toning. High & Low Weight Hyaluronic Acid - Instantly replenishes skin's moisture and gradually provides hydration for long-lasting effect; retains 1000 times its weight in water; fortifies skin's moisture barrier; increases elasticity and minimizes wrinkles. Sustained Hydration Complex (Trehalose, Urea, Serine, Algin, Sodium Hyaluronate, & Pullulan) - Delivers immediate and long-lasting hydration; forms a barrier to seal in water mimicking skin's natural moisturizing factor (NMF); fights water loss. Plankton Extract - Boosts moisture deep within the dermis; stimulates creation of hyaluronic acid; controls moisture levels; promotes skin renewal. Acquacell (Watermelon, Apple, & Lentil Fruit Extracts, Sodium Lactate, and Sodium PCA) - Supplies amino acids; enhances moisture delivery throughout the skin. Xylitol Blend (Xylitylglucoside, Anhydroxylitol, & Xylitol) - Optimizes water retention; stimulates production of ceramides; increases NMF. Alisma Plantago-Aquatica Extract - Seals in hydration and fortifies skin's moisture barrier; reduces inflammation. Water/Eau, Biosaccharide Gum-1, Dimethicone, Polysilicone-11, Butylene Glycol, Decyl Glucoside, Pseudoalteromonas Exopolysaccharides, Citric Acid, Sodium Salicylate, Glycerin, Citrullus Lanatus (Watermelon) Fruit Extract, Pyrus Malus (Apple) Fruit Extract, Lens Esculenta (Lentil) Fruit Extract, Sodium Lactate, Sodium PCA, Glyceryl Polyacrylate, Trehalose, Urea, Serine, Pentylene Glycol, Algin, Caprylyl Glycol, Sodium Hyaluronate, Pullulan, Disodium Phospate, Potassium Phosphate, Glyceryl Acrylate/Acrylic Acid, Laureth-23, 1,2-Hexanediol, Sodium Polyacrylate, Plankton Extract, Alisma Plantago-Aquatica Extract, Hydrolyzed Hyaluronic Acid, Xylitylglucoside, Anhydroxylitol, Xylitol, PEG-40 Hydrogenated Castor Oil, Fragrance, Potassium Sorbate, Phenoxyethanol, Allantoin.